There have been many famous rallying speeches over the whole history of combat, whether it be in the theatre of war or merely a matter of winning a game of football. We can all name the famous motivators in each sphere: Elizabeth I or Henry V, Admiral Lord Nelson or Winston Churchill, each of whom fired up their troops to give their all in battle for England. Sir Alf Ramsey did the same for the Three Lions heroes of 1966 and of course our own Don Revie was unrivalled as he created a team who would run through walls for him, inspired by the steely cry of “Keep Fighting”. But sometimes, tub-thumping speeches should not be necessary – the occasion speaks for itself and demands pride, passion and commitment more than any mere words could possibly do. The Leeds United players who take the field against QPR tonight, 5th April, should be fully aware that today is a date when nothing less than every last drop of blood, sweat and tears will suffice. The United army will demand that – and more – as will those glued to their radios at home. And rightly so. For April the 5th is a date carved painfully into the hearts of Leeds fans everywhere. On that fateful day 16 years ago, we lost two of our own as Chris Loftus and Kevin Speight were cruelly, foully murdered by savage, uncivilised scum in Taksim Square, Istanbul. This evening’s match is therefore not about League points or position, it’s not even about the farcical running of the club or the inept administration of an incompetent and bumbling Football League. It’s about pride, passion, respect and commemoration – and those four qualities need to burn white-hot within the very being of each man wearing that big Leeds badge over his heart at Elland Road. 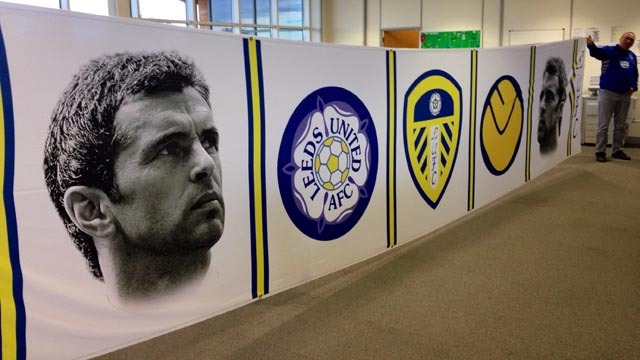 If there are any Leeds players unaware of the significance of this occasion – well, shame on them. And shame on the staff at the club who should be making sure that their charges are at least on nodding acquaintance with a reality beyond their own pay packets. It’s not been easy to admire many of the Leeds players lately; with a few notable exceptions, they’ve played in a distracted fashion and displayed a distinctly chicken-hearted attitude to the business of playing for the shirt and getting results. They should be left in no doubt at all that such frailties will not be tolerated tonight – not on April the 5th. For this match, they should imitate the action of a tiger, as Henry the Fifth put it. They should stiffen the sinews, summon up the blood – and get stuck in, just as if they really did have the hearts of lions. Nothing less will do, it’s the very least they owe the Leeds supporters everywhere. If they don’t know this, then it should be made abundantly clear to them prior to kick off. They should run out there onto that pitch with no thoughts of money or other distractions: they should emerge onto the field of combat ready and willing to give their all for the Leeds United fans, and especially for the memory of those two lads who never came home. This should be an occasion for the restoration of pride, for remembering that they have the honour to represent the greatest club in the world, in front of the greatest fans in the Universe. Defeat is permissible; a defeatist attitude and a failure to step up to the mark is not. Not on April the 5th. Perhaps the match against Rangers can be a starting point for the Leeds United team, the first steps on the long climb back to respectability. It really needs to be – there is simply no more appropriate date for the launching of a fight-back, even though this season is now meaningless – apart from the still lingering threat of relegation. If the Leeds lads can get out there and fight tonight – show that they care, battle for the cause, demonstrate some respect for the fans and those we’ve lost – then maybe they can start to recoup some of the respect they’ve undoubtedly squandered over the past few months. It’s to be hoped so, because you get nowhere in any professional sport without earning respect. The April 5th anniversary of the shocking events in Istanbul really means something to the Leeds support. More than any other date, it’s when we remember and pay our respects – and the players should participate fully in this. It’s part of deserving to wear the shirt and the badge. Fans of other clubs love to show their disrespect, they love to wear the shirt of that awful Turkish club whilst grinning and gloating. Millwall fans, Man U fans – scum like that. April the 5th is when we rise above it all, in dignity and pride. The players need to join in with that, too. Do it tonight, lads – get out there and fight, give everything. Do it for Chris and Kev, do it for all the rest of us who remember them sixteen years on. Do it for the shirt, do it for the badge. Make us proud of you again, on this day above all others. Then, perhaps, we can go Marching On Together towards a better future, whatever the next few days, weeks and months might bring. All it takes to start fighting back is that pride, passion and respect. That’s how we commemorate those who died, and that’s how we’ll forge the togetherness we need to restore this great club to where it belongs. Let’s start that process of fighting back and climbing upwards, on this sad and solemn anniversary, at Elland Road this evening – let’s show them what we’re made of. If we have enough tigers and lionhearts on the park, Queens Park Rangers will at least know they’ve been in a game – which is the very minimum requirement for any true warriors of Elland Road. After all: “We’re Leeds – and we’re proud of it”. 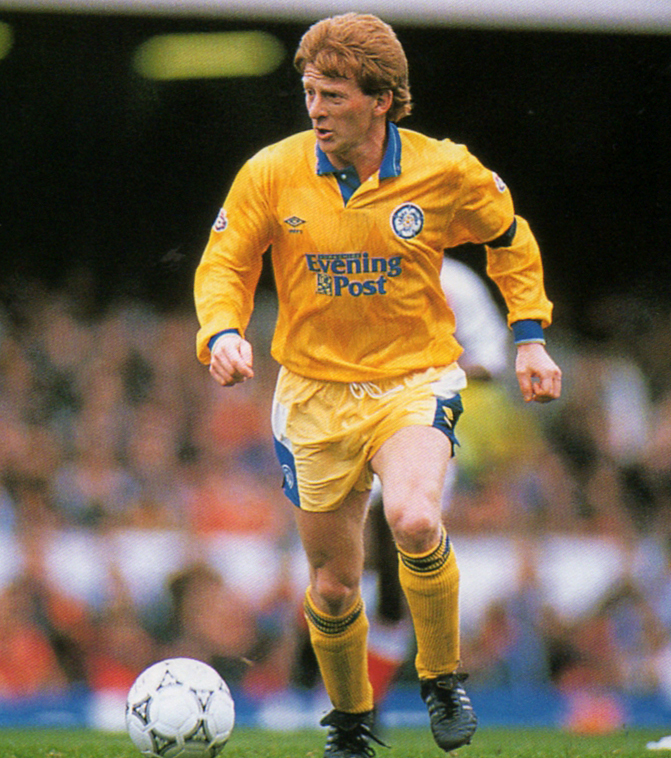 The more I see of football these days, with all of its allegedly “world class” stars, the more I think of the guy who scored the first goal I ever saw Leeds United score – in the flesh, so to speak. His hair was red and fuzzy and his body black and blue, and his name was Billy Bremner. God alone knows what he’d be worth today – sadly, he hasn’t been around since that awful time, 21 years ago exactly, when football was deprived of a legend and Leeds United began to come to terms with the loss of a man who embodied everything that the Last Champions were all about, at their very, very best. On the 7th December 1997, two days short of his 55th birthday, our greatest captain Billy Bremner died following a heart attack after a bout of pneumonia. The Leeds United world was plunged into shock and mourning at the death of a true hero, and the game’s great and good attended his funeral in Edlington. The tiny church, packed to the rafters with household names, was resounding testimony to the respect in which the wee man was held by all who knew the legend. Old comrades and old foes alike were there to say goodbye to an icon who had left us tragically young, but who had emblazoned his name across an era not wanting for stars. 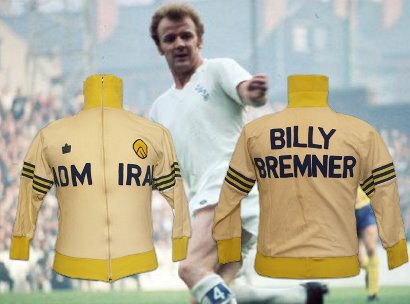 Billy Bremner was quite simply a phenomenon. From the earliest days of his Leeds United career, once he had recovered from a bout of home-sickness for his native Stirling in Scotland, he was an automatic selection for the first team, unless injury or suspension ruled him out. He was a warrior, despite his diminutive size, but he was blessed with all the other attributes needed for a central midfielder on the battlegrounds of the English First Division. Skill, courage, “workrate” – as it’s known these days – were combined with sheer guts, tenacity, will to win – and that indefinable x-factor that ultimately set him apart from other gifted performers. A ball-winner, a talented user of the ball once won, a relentless harrier of the opposition for the full ninety minutes plus of each gruelling game – and a scorer of great goals too. Bremner was a big occasion man, a serial winner of semi-finals (Man U being his favourite victims), a man who unfailingly stepped up to the mark when his team-mates and fans needed him. He was utterly self-effacing in the interests of what was best for the team. “Side before self, every time“ was his motto, and he lived up to those words for as long as he was involved in football. Some called him dirty. And he was as capable as most other combative central midfielders of a bit of feisty skullduggery – but to define him by his occasional sins would be short-sighted in the extreme and would display, moreover, a lack of awareness of exactly what his game was all about. A consummate passer of the ball – with the neat reverse pass a speciality, flummoxing and wrong-footing many an international-class opponent – Bremner was the epitome of Don Revie‘s Leeds United, a team who said “If you want to play, we’ll out-play you; if you want to battle, we’ll out-battle you.” They usually out-thought and out-psyched the opposition as well. Many a visiting player was artfully allowed a glimpse as they passed by of the sign on the home team dressing room wall at Elland Road. “Keep Fighting”, it said – which was what Leeds United, guided by Don Revie off the field and Billy Bremner on it, did – and they did it better than just about anybody else. The Sunday Times perhaps summed-up Billy Bremner as well and as succinctly as anyone. “Ten stone of barbed wire” they called him – the image of a spiky, perilous bundle of energy conjured up in five telling words. I saw an old clip on YouTube recently, grainy black and white footage of some or other game back in the day, and there had been an incident that set the players en masse at each other’s throats. Bremner – unusually – must have been some way off when the flashpoint occurred, for he was nowhere to be seen with the melée already well established. And then, from the right-hand margin of the screen, came this white-clad, unmistakable figure, tiny but fierce, hurtling towards the centre of the conflict with the desire to weigh in on behalf of the team writ large in every line of his being. He was a frenetic mixture of Yosemite Sam and the Tasmanian Devil, plunging into the fray like some one-man whirlwind, wreaking his own inimitable brand of havoc. Bremner was famous, even notorious, for this – for his battle-cry of “cut one of us, and we all bleed.” Billy shed blood in the United cause – usually, it must be said, not his own. But a thug he was not, and any team, any time, anywhere in the world would break the bank to have a Billy Bremner in his prime among their number. Fortunately for Leeds United, he loved the club and served it for sixteen years, becoming synonymous with the famous Whites of Elland Road. As Leeds fans, we could nominate no better candidate for the honorific title of “Mr. Leeds United”. Only the great John Charles, operating in a much less successful era at Leeds and destined to win his medals on foreign fields, could come anywhere near. My second match as a Leeds United supporter was the European Cup semi-final, first leg against CF Barcelona, Johann Cruyff, Johann Neeskens and all. Those two Dutch masters, with all the other glitterati of the Catalans’ world-class line-up were expected to have too much for a United side on the cusp of just dipping over the hill. The previous Saturday, I’d made my first visit to Elland Road and had seen us lose to Liverpool. I was all agog at the atmosphere, and didn’t really care about the result – I just wanted more. 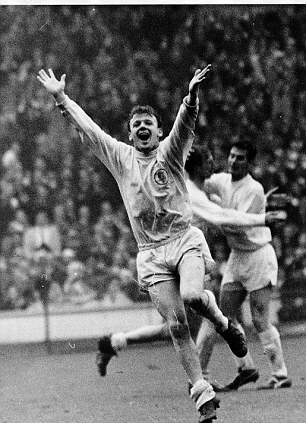 So it was that my first ever Leeds United goal came to be scored by Billy Bremner himself, the greatest player in the greatest team United ever had. A long ball from Johnny Giles, headed down by Joe Jordan, found King Billy in enough space on the edge of the area at the South Stand end. He measured the situation, took aim and rifled the ball superbly, well wide of the helpless keeper, into the top left-hand corner. The din was deafening, like nothing I’d ever heard before, and rarely since. “Elland Road erupts” intoned David Coleman for the BBC, when he could make himself heard. The image of the small, red-headed giant belting that ball home will live with me to my last day. I’ve always been proud that my first goal was scored by King Billy. I feel as though, in a funny way, I own that goal. of the significance of the occasion. “Nine men and Billy….we’ve got nine men and Billy!“, they sang, loud, proud and raucous. “Billy Bremner’s barmy army” got many a refrain as well. The fans had said farewell to the Captain of the Crew in a manner hugely identifiable with the man himself and with the fighting traditions of the great side he led with such distinction. As far as these things can be, it was deeply fitting, and those who remembered Billy gave a knowing nod of appreciation. RIP Billy Bremner. Departed far too soon, and greatly missed still. It’s unlikely we’ll ever have another quite like you. Forty-two years ago today, one of the most notorious injustices in the history of European Football competition was visited upon the hapless heads of Leeds United at the European Cup-Winners’ Cup Final in Salonika, on 16 May 1973. There seems little doubt that the Greek referee, one Christos Michas, was bribed by Leeds’ opponents on the night, AC Milan. UEFA acted in the wake of this tawdry sham, banning Michas from officiating – a tacit admission that something about the match was very wrong indeed. This appeared to be a view shared by the crowd which attended the Final all those years ago; they roundly booed the Milan team as they sheepishly paraded the trophy, showing great sympathy to the unfairly beaten Leeds United team. The game was littered with what might charitably be called dodgy decisions by Michas – fouls not given against Leeds, whose every little transgression was rigorously punished. Milan, it seemed, could do no wrong – Leeds were up against impossible odds, to the outrage and disgust of the largely neutral crowd. A Leeds player uninvolved through injury that night, Johnny Giles, had overheard enough before the match to glumly inform his team-mates in the dressing room that they “would not be allowed to win”. Not the best motivation, perhaps, but borne out in the end by the events which unfolded on the pitch. An attempt at overturning – indeed reversing – this shoddy result took place in 2009 when Yorkshire & Humber MEP Richard Corbett gathered the support of over 12000 people for a petition he presented to UEFA on the 36th anniversary of the 1973 Final. UEFA refused to act on the petition, addressing a long-winded response to Mr Corbett, but failing utterly to expunge from their record such a shameful incident. Milan are still recorded as the 1973 Cup Winners, a situation so bizarre as to be frankly laughable. At a time when the fortunes of the Elland Road club are once again at a low ebb, there’s frequently some comfort to be had in looking back at what has, at times, been a glorious and trophy-laden history for Yorkshire’s premier football outfit. But some anniversaries – this is one, and there’s shortly to be another when we remember being robbed in Paris in 1975 – simply remind us of how much more that great team could have achieved on a level playing field – if they had not been thwarted at every turn by incompetent or bent refereeing, official intransigence by the Football League, the FA and UEFA – or a grisly combination of all these negative factors. 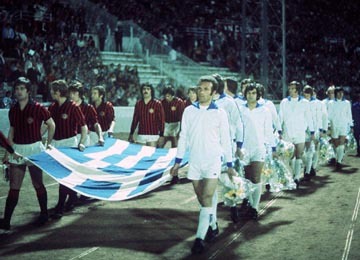 The European Cup Winners Cup Final in Greece 42 years ago today goes down in history as yet another occasion when Leeds United were the bridesmaids and not the brides – the bald facts of the matter will record Leeds as big-time losers once more, sadly, when the real story of that game goes far beyond the result into very murky territory indeed. Leeds fans will quite rightly see their team as the moral victors on a day of disgrace for UEFA. Tragically, the surviving warriors in white from that May evening so long ago will almost certainly never see matters put right – and so the winners’ medals will continue to adorn trophy cabinets that are shamed by their presence there. On a day when we yet again face an uncertain future, and when the prospects of more silverware for our great club seem very distant indeed, we salute the real winners of the 16th May 1973 – Leeds United. 30 years ago today, I went to watch Leeds United play at St Andrews, Birmingham City‘s ground, in order to support the United lads, who still had a faint mathematical chance of promotion. These were the bad old days, when football violence was still highly fashionable, and it was predictable that things would get out of hand given the slightest excuse. Well, Leeds went one down, it was a crap game, and get out of hand things certainly did. There was a mass riot, invasions of the pitch from both sets of supporters, police horses tried to get between the warring groups and general mayhem ensued for quite a time. Inside the ground, a 12 foot wall collapsed and a young lad was crushed to death. It was a tragedy of the times, crowd disturbances were commonplace and only 18 days later, trouble at the Heysel Stadium in Belgium would cost the lives of 39 Italian fans as the European Cup Final between Liverpool and Juventus was fatally marred by ugly scenes of violence. 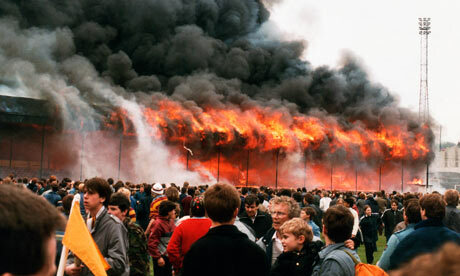 As the Leeds fans emerged from Birmingham’s ground though, we were totally unaware that an event had been unfolding back home in Yorkshire that would cost 56 more lives, leave hundreds injured and traumatised and form another catastrophic part of that dreadful month of May 1985. At Valley Parade, the antiquated home of Bradford City, a fire had broken out in the main stand, a ramshackle construction of timber with an oft commented-on build-up of litter beneath the wooden seats – a calamity waiting to happen. On that Saturday afternoon, as spectators packed the old stand to greet their promotion-winning Third Division Champions, the calamity did happen, and with unbelievable speed and ferocity. At about 3:40 pm, ITV commentator John Helm noted that there appeared to be a small outbreak of fire in the main stand. Within four minutes, on a dry and windy day, the fire had engulfed the whole of the stand, trapping many in their seats. People dashing to the back of the stand for fire extinguishers found none – they had amazingly been removed for fear of vandalism – and the fleeing crowds were forced to break down locked exits in order to escape. Others escaped forward onto the pitch, and within the burning stand there were acts of outstanding heroism as some people tried to assist those less able, without regard for their own safety. The design and build of the ancient stand conspired in its swift destruction; the roof was of wood covered with tarpaulin and sealed with asphalt and bitumen. The whole structure was, in effect, one big incendiary bomb which had been waiting to go off for years. Now, a single lighted match or cigarette, dropped under the seats onto the accumulated litter below, had started a conflagration that raged out of control before anyone could summon help. It was a miracle, aided by the selfless bravery of many of the spectators who rescued their neighbours, that more weren’t killed. As it was, 56 deaths and hundreds injured left its mark on the game, and rightly so. The Popplewell Inquiry led to the introduction of new legislation to improve safety at sports grounds, and construction of new stands from wood was banned at all UK sports venues. Thankfully, the death toll had been somewhat limited by the absence of perimeter fencing around the pitch, a lethal factor in the 96 deaths at the Hillsborough disaster 4 years later. Bradford City’s ground now is unrecognisable from the ramshackle stadium I remember as a student in the city in 1981, when I attended a League Cup tie against Ipswich and marvelled from the open Kop at the sheer age and dilapidation of the wooden stand to my right. A magnificent state-of-the-art main stand now crowns the development which has taken place on all four sides of the arena – a credit to the City, to the Football Club and to the memory of those fans who died – 54 from Bradford City and 2 from their opponents that day, Lincoln City. Later that year, in July, I attended a Bradford City memorial game at Elland Road when the majority of the 1966 World Cup Final teams, England and West Germany, turned out for a rematch. England won again, 6-4 with Geoff Hurst scoring another hat-trick, Uwe Seeler scoring a quite magnificent goal at the Kop End, and the late Alan Ball notching for England too, as did Martin Peters – the other Three Lions scorer in ’66. England were captained by the late, great Bobby Moore, and our own Jack Charlton appeared with lesser-known brother Bobby. It was a wonderful occasion and a fitting tribute to the dead and injured of the Valley Parade fire, raising many thousands towards an eventual total of £3.5 million for the Bradford Disaster Appeal Fund. On this pleasant late spring day, when the memories of that awful summer of 1985 are receding further and further into the past, let us pause and remember those who died this day 30 years ago, as well as the victims of the Heysel Tragedy – and not forgetting young Ian Hambridge who died when that wall collapsed at St Andrews while football fans unknowingly rioted all around. Ian would be 45 now; he and 56 others at Bradford were robbed of their lives by the events of the day. Rest in peace, all of them – and let’s be thankful that we’ve seemingly moved on from that dark period in football and stadium history. Fifteen years ago today, two of our number – two brothers in White – were brutally murdered by cowardly thugs in Taksim Square, Istanbul. Chris Loftus and Kevin Speight travelled abroad to support their heroes of Leeds United play in a UEFA Cup semi-final against a team representing a club that glories – still to this day – in generating an atmosphere of evil and murderous hatred. UEFA themselves were ineffectual back then and have largely remained so, turning a blind eye and a deaf ear to repeated instances of this awful club’s “fans” disgracing the name of football. That’s the background that we’re all too well aware of. But today is about remembering two lads who loved their football club but had their futures stolen from them in a manner that has nothing to do with the Beautiful Game. As has often been said since, nobody should ever set off to a football game, only to lose their lives. The tragedy and poignancy of that bleak sense of loss weighs our hearts down still. The poem below expresses far better than I ever could this sadness – which is yet tinged with pride that Leeds United has such support, that we are a massive global family which suffers together over such a tragedy and that we will never forgive or forget. Justice has dragged its heels, but the Leeds family has always been there to remember those two lads who never came home. I came across this poem just yesterday, and was blown away by it. Sadly, it was written by someone who has since passed away himself – I know only his first name, Dennis. But it expresses what we have all felt ever since that terrible day in 2000 when we lost two members of our Leeds United family. These beautiful verses seems to me to say it all – so I reproduce them here, with thanks and much respect to the late Dennis, who wielded a pen, not a knife – and proved himself a true fan of football and Leeds United. Just like Chris and Kev. Why do you linger still? Whose time will pass us by? The Football League in their arrogance and ignorance seem to feel the appeal announcement should be delayed, for fear of adverse Leeds fans’ reactions live on Sky TV. It doesn’t occur to them that today we’re preoccupied by something infinitely more important than their bumbling and messing about. RIP Chris & Kev, and let’s hope LUFC produce a performance worthy of your memory. Please share this if you’re able. It seems almost incredible – but on the 27th of November it will have been two full years since the tragic news broke of the death, apparently by suicide, of Gary Speed. Rarely can news of a sudden death have taken the football world so utterly by surprise. 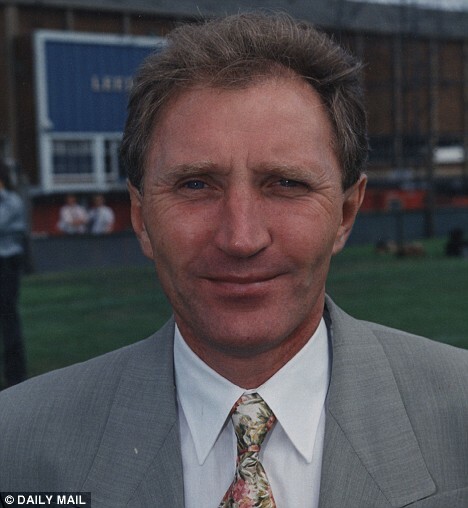 Speed was the current manager of the Welsh national team and, by common consent, was doing a fantastic job in reviving their fortunes. He was a hero to the fans of all the clubs he had served – Leeds United, Everton, Newcastle Utd, Bolton Wanderers and Sheffield United. He was only 42. The eventual outcome of the inquest into Gary Speed’s death was a “narrative verdict” of death by self suspension. A narrative verdict exists to give the coroner the option of arriving at a cause of death without attributing that cause to a named individual. The verdict therefore stopped short of a conclusion of suicide, where obviously there would be an attribution of cause to the deceased. To this extent, Speed’s death remains an imponderable mystery. He had appeared on the BBC’s Football Focus programme on Saturday 26th November, less than 24 hours before he was found dead by his wife Louise. It had been noted by Focus presenter Dan Walker that Speed had been “in fine form”. The shock and dismay among those who had known him, and more widely among his legion of fans, is not easy to describe. The feeling was perhaps best summed up by his close mate Bryn Law, a football reporter who appeared on Sky Sports News to talk about what had happened but, distressingly, was clearly overcome by the emotion he felt. Two years on, the known facts behind Gary Speed’s death are still insufficient to lead to any understandable reason for why and how it happened. Fans at his various clubs have continued to pay tribute to his memory at various intervals, or when two of his former teams have met – as with the Capital One Cup match between Newcastle and Leeds United earlier this season. Tributes have usually taken the form of chanting Speed’s name from the 11th minute of a game, for a period of 11 minutes. This first happened during Leeds United’s first game after Speed’s death, a 4-0 success at Nottingham Forest when Leeds actually scored during the eleven minute tribute. The chant was resumed after the goal celebration subsided. It is planned and requested by Leeds United Football Club that there should be a similar 11 minute chant from the 11th minute during Saturday’s visit of Middlesbrough. The banner pictured above will also be paraded around the ground. Gary Speed was a fine servant to the club, as he was to his other clubs and to his country. An Everton fan as a boy, Speed achieved his greatest success at Leeds United, winning a Second Division Championship medal and then two years later the Football League Championship itself in the competition’s final year. He went on to appear in two consecutive FA Cup Finals for Newcastle Utd. Gary Speed MBE (8 September 1969 – 27 November 2011): proud Welshman and a Leeds United Title-winning hero. Taken two years ago next Wednesday – taken far too soon at only 42. RIP Speedo. The bare facts hardly do credit to a stunning afternoon at Elland Road on November 4th 2000. An injury-hit Leeds United faced old enemies Liverpool in Premier League game which saw Liverpool take a two-goal lead, get pegged back at 2-2, take the lead again – and then finally succumb 4-3 in the archetypal see-saw football match. 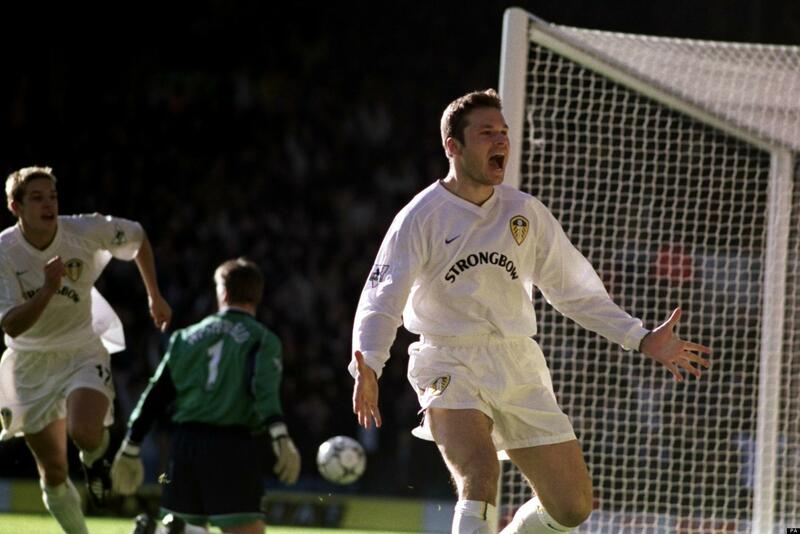 Leeds had won, and Australian centre-forward Mark Viduka had gone one better than the traditional striker’s dream of a hat-trick in a high profile victory. Viduka – the Duke – had scored all four, single-handedly breaking the hearts of the Reds whose manager Gerard Houllier was left speechless with shock and disappointment. In truth, Liverpool were well-set for victory as they cruised to an early two goal lead through Hyypia and Ziege, taking advantage of slapdash Leeds defending. The home team were weakened by the absence of regulars like Nigel Martyn, Lucas Radebe, Harry Kewell, Danny Mills, Michael Duberry and Michael Bridges. Bit-part player Jacob Burns started and Danny Hay would come on as one of only four fit subs – this was very much a patched-up United side. After such a start heads might have gone down in the Leeds ranks, but Alan Smith was still up for the battle, chasing every cause and closing down in his unique combative style. It was a typically aggressive piece of Smithy harrying that saw Leeds back in the game after 25 minutes, as he blocked a Ziege clearance and saw the ball bounce right into the path of an onside Viduka in the Liverpool area. No further invitation was needed; the burly Aussie executed the most delicate of chips to beat Reds keeper Sander Westerveld all ends up. The teams went in at the interval with Liverpool ahead 2-1 – but some of the momentum was back with Leeds. Shortly after the start of the second half, United were level – and this was a goal to remember. Gary Kelly broke swiftly down the right, looked up and delivered a pinpoint cross which Viduka met with a towering near-post header, sending the ball arrowing high into the net for a fantastic equaliser. The effervescent Smith then missed a clear chance to put Leeds ahead, and that looked a costly error when Liverpool surged back in front just after the hour. Berger crossed from the left to find Vladimir Smicer who cleverly worked himself the space to slide his shot past a despairing Paul Robinson and into the net. A bitter blow for a makeshift Leeds side that had hauled itself, against long odds, back into the game. Many indeed would have expected Leeds to crumble at this point, but to their eternal credit they stayed competitive and kept fighting. The next goal was always going to be crucial; a fourth for Liverpool would certainly have finished Leeds off. However, the game’s sixth and best goal saw Mark Viduka complete his hat-trick with a finish of amazing artistry for such a big man. Former Evertonian Olivier Dacourt saw a powerful shot blocked by Ziege, but managed to feed the rebound first time through to Viduka at the right edge of the penalty area. Most strikers would have tried to get a shot off, but Viduka, spinning unpredictably through 360 degrees, threw off the attentions of the Liverpool defence and finished sublimely into the far corner. At this stage, the overjoyed Leeds support would probably have settled for a draw that had, at one point, looked like being more than they could dream of. But Viduka was not finished yet. Only three minutes later, he finally ended Liverpool’s chances with a fourth goal which, it must be said, owed as much to a generous linesman as it did to the Duke’s skill and lethal finishing. The Leeds striker was surely offside as the ball reached him yet again in a threatening position inside the Liverpool area – but he didn’t hang around to see if a flag went up or a whistle blew. In the event, neither happened and Mark Viduka produced yet another delicately-crafted finish, the ball arcing beautifully over a committed Westerveld and dropping into Liverpool’s net. 4-3 now and pandemonium as Leeds led for the first time, as unlikely a scenario as you could possibly have imagined after only 20 minutes of this incredible game. Liverpool fought to the last, but so did Leeds to hang on grimly to their hard-won advantage. Dacourt finished the game barely able to move, the Liverpool players finished it hardly able to believe what had happened to them. The contrasting body language of the jubilant United manager O’Leary and his crestfallen Liverpool counterpart told the story of this result and of a game that will always be a part of the folklore surrounding this long-standing rivalry. Liverpool had fought gallantly and lost. Leeds had defied the odds and their injury toll to win. But the undoubted hero of the hour, thirteen years ago today, was beyond any shadow of a doubt the United centre-forward Mark Viduka. 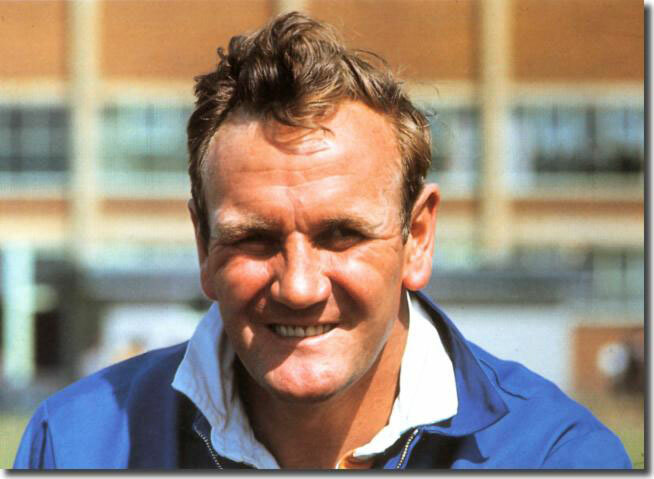 The Duke – Leeds United legend with his own permanent place in Elland Road history.